You can probably look back and find plenty of posts that I’ve written about how unbundling in the airline industry is a good thing. So why am I bothering with yet another post on the subject? Well, Chris Elliott is at it again with a misleading article condemning fees this week. And now that USA Today has given him a bigger pedestal to shout from, I feel the need to shout back with a dose of reality. Fees, unbundling, a la carte, ancillaries… whatever you want to call them, they are a good thing. Let’s see if I can make it easy to understand why. Some companies, notably airlines, promised customers that unbundling offered the “flexibility” to pay for only what they use — and nothing more. But there’s no convincing evidence that they lowered their prices when they unbundled, which is what should have happened. Instead, they just added new fees to their rates, undermining their argument that they were helping you. With the new unbundled structure, those who just wanted basic transportation may not have seen fares go down, but if they went up at all, it’s a lot less than would have happened without unbundling. Yes, they got fewer frills with that fare, but for the first time, they had the choice on whether to pay for everything above and beyond basic transportation. Many people don’t want that, and they pay less today because of it. For those who do want all the frills, however, unbundling has meant they pay more. In other words, without unbundling, the traveler wanting basic transportation would have paid more in order to subsidize the traveler wanting all the frills. That’s why Southwest is often more expensive than other airlines for you today if you aren’t checking bags or making changes. You’re paying for those benefits even if you don’t use them. Now here’s the kicker. People view fees differently than they do fares. They’re much more price sensitive when it comes to paying base airfare than when it comes to paying fees. So if the old structure still existed, fewer people would have been willing to pay those high fares, and that means airlines would have had to cut capacity even more than they already have. There would be fewer choices for everyone and the fares would be higher. Of course, just because unbundling is good doesn’t mean that all fees are good or fair. Elliott tries to lump airline fees in with the one fee that I hate the most – resort fees. These are mandatory hotel fees that aren’t included in the cost of the hotel rate, and that should be illegal. In fact, it would be illegal if hotels were regulated the way airlines are. When it comes to airfare, mandatory fees must be included in any fare shown. Period. Elliott is trying to cast a shadow over all fees by comparing airline optional fees to resort fees, but that’s just silly. They’re very different beasts, and in the airline industry, unfair fees are specifically banned. If only that were the case in other industries as well. If This is Good, Why Do People Hate It? Now comes the big question. If unbundling is so good, why do people hate it so much? That is absolutely where the airlines really screwed themselves. As mentioned earlier, when fuel prices skyrocketed in 2008 and airlines began to bleed profusely, they grasped at straws to find a way to right the ship. It was that introduction of first bag fees that really saw unbundling take center stage and ultimately enabled the airlines to get back on firmer ground. The problem was that the airlines were so desperate to raise revenue, that they failed to really think about the customer experience at the time. It was one of those “shoot first, ask questions later” moments, simply because they were on the brink of financial ruin. Because of that, implementation was clunky and disclosure was poor. So it is indeed true that things didn’t start off very well, but that hardly means the practice of unbundling is a bad one. It’s just that the airlines set the precedent for hatred by doing it wrong in the first place. Since that time, airlines have become better and better at displaying things properly. If you don’t know that a seat assignment will cost more or that you can pay for things like priority boarding or extra miles, then you just aren’t paying attention. Links to bag fees are made available during the booking process, though that’s an area where further work should be done by the legacy airlines. (The low cost carriers are much better at it.) If there’s any place where the fee structure is misleading, it’s not on airline websites but rather on third party online travel agent sites. But that’s a separate issue, and it’s not the airline’s responsibility to spoon feed them all the details. Online travel agents should be held responsible for providing an accurate display of what’s being offered, not airlines. But I digress. In the end, the result of unbundling is clear. People pay less in base fare than they otherwise would, and they can pay more if they want more. Not everyone likes this, of course. Those who check a lot of bags, pay for meals, and pay for seats will undoubtedly be sad that others aren’t subsidizing them anymore. But just because they don’t like it doesn’t mean they can’t see that it’s the fair way to do things. If only the reporters writing for big newspapers could see that as well. Chris Elliot is a total fraud. It’s easy to rile up the masses and their pitchforks since airlines are easy targets, but his claims are so unfounded it’s comical. In the oil price run up when airlines were burning the furniture trying to stay alive he penned an article how airlines were using fuel as a convenient cover to raise fares and lauging (crying) all the way to the bank (to beg for another loan). The guy is truly awful. I will agree that un-bundling is good for many people and carriers. I want the cheapest possible seat, and will probably go experience inconvenient layovers/itinerarys/backtracking to get that cheap ticket. However, I was at the Spirit counter last week, where you can avoid the “Passenger Usage Fee” to purchase a ridiculously cheap fare to Dallas to visit my grandparents in October. ($34 r/t! no bags, or seat assignment, of course) While I was standing in line, a couple was in front of me with a purse they weren’t aware that they would have to pay for. Fifty dollars for a “carry-on”. Another man was sure that his roll-aboard would fit under the seat in front of him. It wouldn’t. Fifty dollars to pay for a carry-on at the counter. Then another man walked up to check his bag and hadn’t paid for it in advance. One hundred dollars to check a bag at the counter. For the educated and well-informed among us, unbundling is great as we pick and choose our way through ancillary services to get a great deal. For the clueless occasional traveler, unbundling can be very confusing and further stress travel. Evan – It’s very true. People need to be aware of what’s happening. If you fly Spirit and book through Spirit, then I can’t fathom how anyone wouldn’t know the deal. They make it very clear. But if they book through a third party online travel agent, then things can be awful. That’s why online travel agents need to get their acts together. By the way, a first checked bag is $45 at the counter. If he went to the gate, then it would be $100. Sounds like Mr. Elliot is just whoring himself out like so many of these ‘experts’ the media likes to toss out when they need someone to comment on something. There no truth in jounalism anymore, just say something to cause an uproar in the public to get ratings. Mr Elliot is just the ‘go to’ guy when the media needs someone to be negative on an issue which allows him to promote himself and any books he writes or whatever else he does. I know there is consumer psychology in there but the reality is when you get home and open the credit card bill with the base fares + a big charge by the airline for bag fees the consumer gets upset. Granted the airlines are better today at displaying fees and people are more used to the bag fees now but execution in the begining was terrible. Overall I agree with your thesis but I tend to think the airlines should’ve just raised fares. As you stated they are cheap, IMO way too cheap. By keeping fares low air travel has become our nations defacto travel option and hasn’t pressed any urgency for European style rail or other transportation networks. Air travel is great for convenience and speed but without other viable options it’s hugely inefficient for what many people use it for today. A – If airlines just raised fares, we’d see a lot less service than we have today. It wouldn’t be good for anyone, though results would be mixed for those who check a bunch of bags and pay for other ancillary services. They would probably pay less than they do today but they would have fewer options. It’s interesting to think about whether this would have changed anything with rail, but I don’t think it would. The distances in the US are just too great and population centers too spread out. The only real exception is in the northeast, where rail already exists. Elsewhere, the cost to build rail is insanely high and it wouldn’t get much usage. I’m particularly curious to see what happens here in California when the line gets built. It’s absurdly expensive to build, but you would hope that there would at least be enough traffic to get decent usage. I’m not sure I agree that we’d see fewer options had the a la carte pricing never happened. Adding things like IFE and Wi-fi are marketing strategies to get my to fly Airline A over Airline B. Those options still would’ve been picked up by the Airlines to get that leg up on the competition, be it ever so small window until they all offered it. Unfortunately there is no way to know where our transportation system would be had airlines raised prices to match the reality of what it costs. I would include airline bankruptcy, gov’t bailouts, airport subsudy, etc. into the true cost of the business. If the consumer really absorbed all the costs into his ticket who knows what would’ve happened. My opinion is that today we have an awful lot of air travel happening where the person traveling really doesn’t require the speed jet travel offers, and often that speed is wasted shuttling the passenger to a hub many times in the wrong direction. I love planes and air travel but I really don’t think it’s best used shuttling the family to DisneyWorld or bringing Junior home for the holidays. Just re-read my comments and I’m going way deeper than just ancillary fees. It would be intersting to see a bundled fare next to the unbundled. What would a meal in coach, included wi-fi and all IFE, etc. cost these days? I’d be very curious. My guess is the cost would be minimal enough (under $100) that airlines could’ve saved a lot of bad press by going that route years ago. Who knows. A – Sorry about that. I don’t think I was clear in my response. By fewer options, I meant fewer flights to choose from. I wasn’t talking about onboard amenities. I think we can back into the costs. Just look at ancillary fee revenue and see what happens when we put it into the fare. I don’t have time to do the pull today, but it shouldn’t be too hard. It wouldn’t give specific pricing, of course, but it would show the difference in average fare. Then again, maybe that’s not really helpful on a systemwide basis. Unbundling is only a good thing if you care about airlines health as corporations. I could not care less. I want to get from New York to LA. I do not care who gets me there as long as it is not expensive. Whether the plane says “Delta”, “United” or “Virgin America” on the side is irrelevant. If one day “Delta” stopped flying, “Some other airline” would come in and take its place. People hate it because they can see that they are paying more and getting less and no one likes that. Meanwhile airlines book record profits. This also makes the recent airline consolidation even more difficult to stomach from a consumer perspective. We are quickly heading towards a telco/Internet situation where a handful of airlines will control the market and that is never good for consumers who like low prices. It was pollyanna to assume that unbundling would lead to lower base fares. However, much like fuel surcharges, it is not a good thing for consumers at all. If airlines had raised fares to make up for what they take in “fees” I do not think that would have been sustainable (since they make so much on the fees). But that is just my opinion and I have no hard data. PeteyNice – If you really think you’re better off without the fees, then that means you check a bunch of bags, pay for seats, pay for food, etc. Because if not, you will pay less with the fee structure. You hate fees, but you also think raising fares would be unsustainable. So is your proposal that airlines should just keep losing money so you can get cheap fares? I do none of those things. But I can compare what it cost me to make similar trips pre-unbundling vs post. I am certainly more than I was. In some cases significantly more. Paying less than I “could be” is vague and hard to pin down or prove one way or another. I do not care if the airline loses money. That is not my concern. I only care about getting from point A to point B as cheaply and as safely as possible. If they can’t make money they should go away. My complaint is that when they lose money they come crying to the government for a bailout and then they lobby hard against any kind of consumer protection and keep jacking up these fees while making record profits. I certainly have no Constitutional right to cheap fares, but I do have a Constitutional right to complain about how quickly the price of travel has gone up with or without these fees. My main point is that the airlines don’t care about me at all, why should I care at all whether they make money or not (except in the context that if they don’t, they will ask for another bailout)? PeteyNice – Ok, fine. I don’t care if anyone makes money so I want everything to be free. That seems fair. Airlines are businesses like any other in that they need to make a profit to survive. As a consumer, I can respect that and understand when prices rise to make sure that happens. If they start to make windfall profits, then there should be talk about antitrust, but that’s not happening at all. A record profit for an airline is a poor profit in just about any other industry. If you really want to avoid future government bailouts, then you shouldn’t want to continue to buy cheap fares that keep airlines in the red. That’s the surest way to get further government action when they end up failing. Petey, which airlines have asked for a bailout? The $5B “bailout” of 2001 (with other insurance guarantees and loans) is miniscule compared to other bailouts such as the one the auto industry received. Since then, I’m not aware of many, if any, airlines that have asked the government for a “bailout”. Filed for bankruptcy protection? Yes. That’s a different story. Also, you should care whether an airline makes money or not. If they don’t make money, they will eventually cease operations or be bought for pennies on the dollar by the bigger players. This could lead to decreased competition which in turn could lead to even higher fares. Vote with your wallet. Take the train or bus – if you can find one. People voted…that’s why we don’t have players like Midwest Airlines anymore. Dear David SF eastbay, I understand your frustration, but please don’t paint all journalists with the same brush. Some do a very good job of tweezing out the truth from the hairball of BS. I am continually baffled by those who attack fees and ignore the context in which they were introduced: spiking oil prices, recession, etc., etc. Well, not really baffled, given the sorts of lobbying campaigns that said players have engaged in previously. What bothers me most is when lobbyists call themselves journalists. That pisses me off. longtimeobserver – Very true that Spirit has been working to lower base fares as it introduces more fees. Of course, Spirit has been doing that from a position of profitability so it had less of a hill to climb to make that work. Air Canada is a great example of an airline that did a much better job with implementation. It started off by easing people into the idea with positive incentives, as you mentioned. The display they use on the website is very clear. And they created new fare bundles as well. That’s a subject for another post, but it’s an idea I like in general. (Unbundling only to rebundle… but it’s different.) Had the other airlines taken a gentler approach the way Air Canada did, then we would probably not have so many people hating fees. Yes, AC innovated via positive and creative merchandising/display that was fairly well-received, whereas US legacies used a simpler, negative, a la carte, nickel-and-dime model that is nearly universally hated. GDS limitations did not keep AC from doing it the right way. Unbundling has had made me choose to travel with one carrier and its partners since if you travel enough you get free bags and along with other perks. Since the airlines don’t provide meals in coach anymore, I make sure I carry enough food to keep from being cranky on board. I can go to the store and get something better than what they served anyway and for as much as I’m willing to spend. I just eat when they serve you drinks. As for a mandatory resort fee, I will never return to a hotel that plays that game. Another fee that really annoys me is parking for hotels in suburban or rural locations where you could just park on the street for free. Heck, I did that once and it saved me like $20 a day. I agree that parking fees are incredibly high at hotels. I stayed at the Hilton in Pasadena,CA last weekend and they wanted $18/day for self park and $21 for valet. The train-station park & ride 2 blocks away… $2 per day. Needless to say, I paid $4 and walked for 2 minutes. Another benefit of unbundling is that each creature comfort has to sell or fail based on its own quality and perceived value. Take food–when meals were included in the fare, there was no incentive for the airlines or the catering companies to make the food good, after all it ‘sold’ regardless of quality. Now, if the food is bad, no one will buy it. The result is that the buy on board food is actually really good. Or look at wi-fi–only as an a-la-carte option is there any incentive to even offer this. Bravenav – Taking that even further, it helps reduce costs. Before you had to board enough food for every person regardless of whether they wanted to eat or not. Now you have fewer, better meals onboard so you reduce spoilage and provide a better product. And it reduces weight too. Right on target, as usual. It’s not necessarily rational, but travelers are, in fact, less price-sensitive to fees than to base fare. Airports (who hate unbundling because fees are not subject to excise taxes from which they benefit) actually tested this theory for airlines by arguing (correctly, it appears) that ever-higher PFCs do not significantly affect passenger demand. I do think that it is balantly unfair to the government that all the various unbundling fees aren’t taxed at at least the excise tax rate that you pay on a base ticket. For example one person who lost money (not including passengers wanting to bring luggage, change tickets ect.) when Spirit lowered fares and unbundled: Uncle Sam, who no longer got to collect the % excise tax and the new extra revenue. This means there is now less money to maintain our airports, for the FAA ect. SubwayNut – And that’s part of a post I’m writing for next week! The tax issue only impacts domestic itineraries because international ones have no percentage tax (it’s all flat). But domestically, I do wish ancillaries were taxed. It would encourage airlines to do some things today that they won’t do because of the tax hit. Like I said, I’m going to write this one up further next week. For decades, the airfare the airline quoted was the airfare paid (except for misleading ?bucket shop? ads that quoted one way fares that required a round trip purchase.) Now there is this new system with a low-ball fare quote that bears no relation to what you actually pay. People want transparency. They hate being nickel and dimed. I’m glad that bags still fly free on WN and try to support good corporate behavior by flying them whenever I can. When did the fuel prices come down? We’re still at over $100 per barrel ($108 as I type), as we have been the last three years. Before the 2008 runup, the price was in the $60’s. Cranky, I’m not saying that I mistrust you, but you appear to have a conflict of interest here. You run a business that helps people interact with airlines. Of course it’s in your interest to 1) have airlines make more money, and 2) make their fees as misleading as possible. Once again, I’m sure this didn’t affect your opinion, but I’m just pointing it out. Jim – Explaining fees to people is a very tiny piece of our business, but it really shouldn’t matter anyway. People can read the post and judge it on its merits. It’s just economics and not an opinion, so bias doesn’t really come into play here. But I will argue with one thing you say here. My business gets zero benefit from whether an airline makes money or not. We just help people with the airlines that are out there and it’s irrelevant if they make money. (Heck, we send a lot of people on Alitalia!) And I personally get no benefit either. I don’t own stock in any airlines and I don’t do work for any airlines. One could argue that less profitable airlines are better for CrankyConcierge. 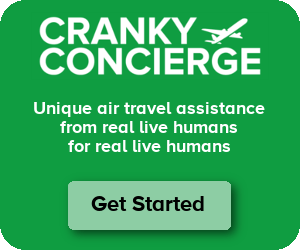 A less profitable airline would have less ability to properly handle irregular operations, which IMHO is one of the major values of CrankyConcierge. You know I love your site and respect your opinion, but Elliot’s rant is just a reflection of public sentiment. The public now hates the airline industry which isn’t good for anyone. Some of the fees for checked bags, food, or entertainment make a little sense, but many of them are bizarrely unhinged from reality. $200 change fees that cost more than some tickets? $1,000 international lap child fees? Families forced to pay seat fees just to sit next to young children? These practices invite regulation. I was at an event this year where Bob Crandall summed it by saying the airlines were doing a better job of ruining flying then Washington ever could. So airlines would rather be profitable than popular, I get that, but the industry is suffering. Passengers and crew are becoming more adversarial as staff are prowling for more fees, and it takes forever to board with everyone carrying on everything to avoid bag fees. Regular people just want to avoid flying as much as possible, and I don’t see how that helps the airlines. Here in Denver, the explosive growth of SW (construction of 5 new gates announced this week), at the expense of UA and F9 shows that many of us are voting with our feet. Nevertheless, keep up the healthy debate! Jason Steele – No question that people hate the airline industry, but I think you forget that this isn’t a new thing. People have hated airlines for years, and Crandall can take credit for his work implementing modern revenue management at American. People just find different things to hate as they go. It used to be that the meals were terrible. Or the prices were high. Or flights were delayed. Or whatever. So this isn’t a new thing, and fees are just one more thing people can latch on to. Without fees, people would just complaint that fares are too high. To be clear, I agree that it’s not good that people hate the airline industry, but I really don’t think fees are the culprit. They’re just another thing in a long line of things people can hate. I’ll grant you that people have always complained, but would you concede that some of the airlines are getting a little too carried away with these fees? Isn’t there such a thing as too much of a good thing? The piece about families having to pay to sit next to each other is a little different in my mind. It wasn’t uncommon before to have to split up with your family if seats together weren’t available. And there was no way to fix that until you got to the airport. But with some seats being reserved for payment, now you at least have the option to pay for it. Yes, there are fewer seats that are available to assign for free, but I kind of go back and forth on that. Fees or no fees, air fares are a bargain. When USAir began the unbundling the CEO sent an email to all members of the frequent flier program and basically said EXACTLY what the USA Today writer wrote. And USAir fares didn’t go down for those of us who didn’t want frills. Some great comments. I agree with Cranky for the basic logic of the argument-if I’m not checking a bag, eating a meal, etc, why should I pay for it. I also agree that $200 change fee is just pure greed, and shows somewhat the airlines think of their customers. I think we all agree the basic job of an airline is to carry you, and me from Point A to Point B. This is where the problem lies. Last quarter UA made a good profit-but it was provided by the fees-they had a loss in operations. If they are not making a profit doing the basic job of carrying people from Point A to Point B, then they need to raise fares-this is Econ 101 stuff. The other problem with fees is depending on your status-you can avoid some of them. I get that-reward your loyal customers. However you are now cutting your profit making generator-and in UA’s case, at least on the flights I fly (90 percent of the time IAD-DEN) at least a 3rd if not closer to half the passengers have elite status-so there goes at least the bag fees, not counting the food and drink fees for the upgrades to first. Finally (once again Econ 101 stuff) keep nickel and diming people enough, and they will find alternatives. As Cranky pointed out Southwest is higher on average fares but no fees in a given market, but as another poster pointed out, they are expanding even more in Denver at the expense of UA and F9. Hey is it illegal for airlines to charge a fuel surcharge. Other modes of transportation do it why don’t airlines? 1) the core of the argument is that the “alternate pricing structure” of fees is a good thing because oil prices spiked. it follows then that if airline costs go down then the “alternate pricing structure” does not hold. right — please hold your breath. 2) the corollary of the argument is that unbundling is universally a good thing, because “the traveler wanting basic transportation would have paid more in order to subsidize the traveler wanting all the frills”. apparently you haven’t had a wireless phone for long — until the 90s unbundling in wireless was all the rage, with voicemail, caller ID, call waiting and even three way calling all separate features each with its own fee (oh, and texting too). Of course, why would everyone have to pay more to subsidize the caller wanting all the frills? voice mail systems don’t come free, after all, goes the argument. result? unbundling has been proven to have been an utter failure. you can hold me it here first, but I am certain you will never see voicemail as a separate option with its own fee on your wireless phone bill. and i don’t use it. 3) part of your argument is that “fares” are lower. whoopty doo. exclude fuel surcharges and they’re lower still. economically the only figure that counts is how much the average traveller pays in TOTAL. everything else is obfuscation (see below). 1) That’s not the core of the argument at all. High oil prices were the reason this structure was introduced when it was, and that’s why fares didn’t go down at the time. Oil continues to be far higher than it was before the spike and that seems to be a steady state. But the new structure is a good idea regardless of the price of oil. That was simply the initial catalyst. 2) There are still plenty of add-on fees that my wireless provider has, and I pick and choose the ones that I want. Do I want to pay for data? If so, how much? While I don’t get charged for voicemail, I would get charged if I opted for the voicemail-to-text feature. I don’t care about that, so I don’t pay for it. The reality is that some things end up being more core to the experience and are included while others are not. For the legacy airlines, you can think about soda as one of those core experiences. US Airways tried to charge for it, and it didn’t work, so they changed it back to being included in the fare. 3) That’s absolutely not true. It doesn’t matter what the average traveler pays, because every traveler wants something different. That’s the whole point of this structure. People pay for what they want and not what the “average” traveler wants. 4) If you have a problem with lack of pricing transparency, then you should direct your argument at those who are doing the price aggregation. They should be the ones providing all the pricing information in one place to consumers but instead they’re stuck in the 1990s where they just show the fare. Pricing details are readily available for every airline but the online travel agents have failed to do anything with it. Hillrider – The thing with 2) is many of those telephone system services don’t cost anything, its a matter of making a simple setting change. I remember at one point reading about setting up your own telephone company that would simply re-sell the Baby Bell’s services, the rate that the resellers paid was approved by regulators and call waiting had a $0.00 cost. In many ways its cheaper for telephone companies to just provide the bundle since then customers don’t call to add/remove services, which is where the real cost is. Back to airlines, yes the baggage systems are paid for, but I’d be curious if there are a few fewer ground employees as there are less bags to load. I used to remember a 737 having a 5-8 car baggage train, it seems now a days its 2-4 cars. 5) pretty graphs, but there are no data sources. it seems that you made up the data. I think the difference pricing points are good for the industry as a whole it really boils down to like cranky stated how these fees are presented as an option and for the airlines to find away of not coming off as nickel and diming the consumer. Cranky, sorry but you are TOTALLY WRONG! All companies have found out that ?unbundling? and charging fees is a GREAT way to make lots of money! Companies charge a base price then slowly add 100?s of fees knowing that a customer can?t keep up with it all and just pay them. In the end the average customer pays MORE! Examples: Banking Industry, Cruise Industry, Hotel Industry, Cell Phone Industry, Utility Industry, Rental Car Industry, the list goes on and on. I’m late to the party, but had to get a lick or two in. First off, I wouldn’t even bother trying to argue with Chris Elliott on this issue. The only thing you’ll get in return is a notation on his blog that you’re an “airline apologist”, usually followed up with some kind of snarky attack. I learned that the hard way a couple of months ago, and have stopped reading his site since. Second, you touch on this in your piece, but IMHO one of the biggest failures of the unbundling concept was the failure of the airlines and GDS systems to work together to roll out a clearer interface that incorporates both base fares and fees into the display. Perhaps the airlines could have enticed the GDSes with some kind of incentive fees on upsells if they agreed to play along. Instead, we ended up with this silly war between the airlines, GDSes, and OTAs, which just ends up fueling all of the complaints of unbundling being “deceptive” (I think Ben Baldanza once said something to the effect that GDSes generate 5% of their customers but 80% of their complaints). Yes, I know getting all that worked out is harder in practice than in theory, but the airlines could have saved themselves tons of grief if they’d gotten a deal done before the fees were rolled out – and I have a hard time believing the unbundling concept hadn’t at least been discussed internally prior to 2008, so you would think they would have had time to do so. Unbundling was raised with and resoundlingly rejected by at last one airline luminary CEO as early as 1993. MeanMeosh – Ah yes, I have been called both an airline apologist and fanboy by Elliott on his Facebook page. Instead of debating the points, he seems to resort to that tactic. I’ve continued to try to set up a debate with him, but so far, he won’t respond. GDSes are now finally coming around. Well, at least some of them. You can buy easyJet flights with all related fees in Travelport systems and Amadeus just announced the same, though I don’t believe any of these are live for US agents yet. With Sabre carrying the majority of the market in the US, we face an uphill battle in getting this to happen. But it will. Unbundling depends on two factors, i.e. what do you personally want, and what are the added costs to the airline for some amenities. In the first category, I do not want to be charged for crumby movies and would like this removed from my fare. I’d rather see the Grand Canyon, but I do not have that option. On the other hand there are amenities that don’t cost more than pennies. When US Airways absorbed Allegheny there was a problem with giving the customers a full soda, or just pouring from the can. This was stupid since the cost savings were minimal and the labor cost was the same. The airlines may need to see what really costs them more versus what customers are willing to shell out bucks for. High fees are completely caused by the internet. Follow my logic; a person (without a lot of knowledge) goes to website, plunks in where they want to fly and then “SORT BY PRICE”. In order to get to the top of that list airlines/hotels/whatever will do anything, including ‘unbundling’ things they know the person will need to purchase. In the past a travel agent would be able to add the value add of “but that airline give you a better meal/more free luggage and way more legroom” but that’s a thing of the past. As for the comparison with “resort fees”, fuel surcharges represent exactly the same thing. Most carriers charge more in “fuel surcharge” for a transatlantic flight than the total fuel cost per seat for the journey. How is paying for 120% of the fuel a ‘surcharge’, it’s either outright fraudulent or oil companies paid airlines to take fuel in the past. CZBB – Fuel surcharges are most definitely not the same as resort fees. Fuel surcharges are required by law to be included in the quoted fare whereas resort fees are simply tacked on at the end. Fuel surcharges today are really just easy ways to implement fare changes, but it makes no difference to the traveler. The price looks the same. Many readers here may be too young to remember World Airways and $99 transcontinental flights. The fact that I can now buy a ticket for $149 on a transcontinental flight some thirty years later, from pricey Philadelphia no less, really speaks to the case for airlines charging fees. Without them it simply wouldn’t be possible. Look at price increases at the grocery store, cable bills, heating and cooling at your house. I dare say those increases have been greater. But an article on the rise in groceries prices isn’t really going to grab your attention when you open a paper, and USA Today knows that. I’m not too old! I worked at World Airways then. I think we were the first ‘alternate sales model’ as well, When we first started operations (April 11, 1979) we did not have a standard TPF reservation system. Instead, we sold our tickets through Ticketron, absolutely unheard of at the time. Passengers mailed in their names to our central office, and my ‘reservations’ office would take the paper forms and send out teletypes to the stations with the passenger lists each night. I guess we were the first ‘unbundling’ sort of as well. We had 4 fares when we first flew: Cash, Cash with a Meal, Credit Card, Credit Card with a Meal. Of course, World folded to industry pressure soon after, joined a reservation system, let travel agents sell their tickets, and became just more noise in the deregulation crowd of the late 70s and early 80s. I remember the 99$ fares vividly. You could also combine it with a 50$ coupon. There were riots at airports with people buying those fares. The big issue was people felt cheated since the airlines could have handled it better. Before a ticket costing say $100.00 people got the seat assignment, checked bags, got the soda/coffee and a meal on a longer flight. If the airlines had said ok now your price is $60.00 and if you want this other stuff it will cost you, but if the traveler paid what they wanted and the ticket still cost about $100.00 they would have been good with that since they would have understood it all more. The traveling public doesn’t know air fares are way lower then they should be. If air fares were in line with inflation, Greyhound and Amtrak would be more busy and the roads more crowded are travelers drive on vacations. Where the bundled fares made sense for me as a business traveler. In 2008, I worked for a Fortune 500 company with travel policies. I had to purchase within $100 of the cheapest fare on the days I was traveling. Because I flew enough on 2 airlines, I could usually get a decent seat. Once the fares were unbundled, I had another expense to deal with. Paying to check a bag is often done at the airport and some of the auditors wouldn’t approve it. We eventually were given a policy that said we could only check a bag if we traveled overseas or were gone more than 6 days. I’ve moved from that big company to a smaller company with a simple travel policy–“Spend our money like you’d spend your own. You’re on the road 60 days a year, so travel in comfort, but not in luxury.” Most of the time it’s just me and my small roller, but when I get on smaller RJs I prefer not to fight with the bins. Then, I’m happy to pay. As for Mr. Elliott, I used to read his blog. But his frequent diatribes against frequent flyers with “elite” status were too much.